If you are dealing with the constant fear of rejection, lying in bed at night wondering how you’re going to find your next client and sick of potential clients blowing you off and not giving you the time of day, then it sounds like it’s time you were doing something different in your business. Many entrepreneurs and business leaders think that the traditional way of doing business, cold calling and advertising, will fill their client pipeline. While these methods can be effective, you’re about to learn a completely new model for enhancing any business — a new system that is being embraced by small business owners, experts, speakers, consultants, coaches, CEOs, entrepreneurs and business and thought leaders that will showcase you as the #1 “go-to” authority in your industry. What difference would it make in your business to be perceived as the “go-to” person in your industry and stop the client chase, once and for all? For most who have attained this status, it means: attracting more quality clients who will pay you top dollar for your advice, opening more doors to bigger opportunities, developing multiple streams of income sharing your knowledge with others, being the hunted rather than the hunter and doing business in a way that fits your lifestyle. The biggest benefit of being the “go-to” person in your industry is financial freedom and your biggest problem is saying “no” to clients and opportunities that are not right for you. What's the #1 best way to set yourself apart and above your competition? What are the benefits of being the "go-to" person in your industry? What is the authority mindset? What makes an authority book the "Ultimate Sales Magnet?" Why is having your own authority book is essential in today's marketplace? How do I determine the topic of my book? Is it really possible to create my book in 60 minutes? How can someone get more information about you? There are a number of advantages to being the highly paid authority. Let's begin by defining what an authority is, as there are a number of definitions. To some it's synonymous with being the expert, thought leader, or guru in your industry; the "smartest person in the room;" or people who are the very best at what they do. To others, it's someone people listen to, take notice of, recommend to others, buy more readily from, or someone the media comes to when they want a quote or interview. In my mind, an authority is someone who knows enough to help their customers and prospects with a particular problem and is willing to share that knowledge. I like to think of this as being an educator and advocate for your clients. Wouldn't you find it easier to talk about yourself as an educator and advocate for your clients, rather than the expert? What are the advantages to being an authority? Can anyone become an authority? What's the #1 best way to become the outstanding authority in your industry? What about those people who say, "My business is found on the first page of Google. Isn't that good enough to make me an authority?" What are the building blocks of establishing your authority? What is an authority platform? Why is it necessary? What are some ways you can build your authority platform? What are 5 effective ways to amplify your authority? To grow your business, you need more clients and customers. Not just any clients and customers, but targeted customers who will become raving fans. Chances are they are listening to very specific podcasts. Are they hearing you? Podcasts are hotter than ever, and with over 46 million people listening to podcasts, it is a powerful way to get heard.Your ideal clients are already listening to podcasts. If you're not currently being featured on podcasts, you're missing out. Find out how to double your business being a featured guest on the exact podcasts your best prospects already listen to. Why is podcasting so hot in 2015? Why not start your own podcast? 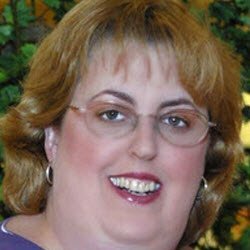 Who is the ideal podcast guest? What type of person/business won't work as a podcast guest? Why do podcast interviews work? What's a quick and easy way to find hot podcasts? What's the biggest mistake that podcast guests make when pitching themselves to podcast hosts? What should I look for when seeking a guest slot on a podcast? What's the strongest way to convey information to listeners in a podcast interview? What the critical missing ingredient that podcast guests fail to deliver in their interview to help them turn leads to listeners? Where can listeners find out more information about you? Donna Gunter, Amazon Best-Selling author of Biz Smart Quick Guide: 10 Strategies to Online Visibility for More Traffic, Clicks and Profit!, helps entrepreneurs and business leaders stop the client chase by leveraging their knowledge to gain authority status in their industry, then dramatically amplify their message and show how to convert the new audience into high paying customers. 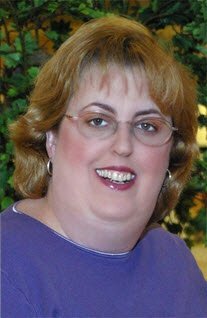 She does this by creating newsworthy events that position professionals as the top authorities in their field, then maximizes their exposure for the event on sites of ABC, NBC, CBS, & FOX affiliates plus other newspaper and authority sites. Some of the newsworthy events she has created for her clients include radio, television and podcast interviews; profile pieces on authority websites; magazine articles; and featured experts in published books. Gunter is the owner of BizSmart Media and BizSmart Publishing, host of Ultimate Authorities Radio, Founder of Authoritypreneur Nation, and a contributor to USA Today, CNN iReport, Business Innovators Magazine , Small Business Trendsetters Magazine, and Online Marketing Magazine. She has been featured on ABC, NBC, CBS, FOX, CNN, among others. 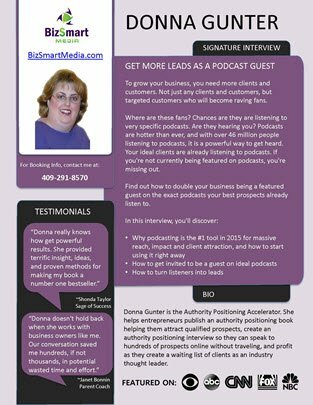 Donna Gunter, authority marketing strategist and best-selling author, helps entrepreneurs and business leaders become highly paid authorities by teaching them how to go from relative obscurity to the #1 authority in their industry. She does this by creating newsworthy events and books that position professionals as the top authorities in their field, then amplifies their message and shows them how to convert their new audience into high-paying customers. 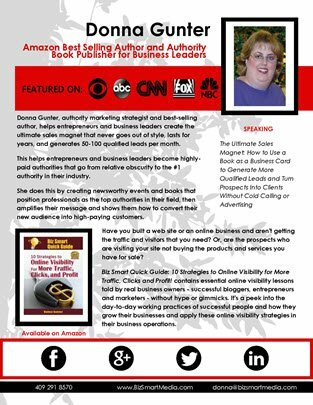 Donna Gunter helps entrepreneurs and business leaders create the ultimate sales magnet that never goes out of style , lasts for years, and generates 50-100 qualified leads per month. Right click on the photos to save to your desktop.